Soviet prisoners of war (POWs) constitute one of the major groups that fell victim to Nazi German mass violence. For territories under German military occupation, the Department of Military Administration, Quartermaster General in the Supreme Command of Ground Troops (OKH) was in charge of Soviet POWs, whereas in Germany and areas under German civil administration, responsibility lay with the General Administration of the Armed Forces under the Supreme Command of the Armed Forces (OKW). Prior to the attack on the USSR on June 22, 1941, German military authorities had decided that international law would not apply to Soviet POWs (unlike Polish, French, or British prisoners), with minimal provisions made for their shelter, food, transport, and medical supplies. Later Soviet proposals that both sides act in accordance with the Hague and Geneva Conventions were refused by Germany. On OKW instructions, most Soviet POWs were not registered by name in the camps in Soviet areas under German military occupation (Durchgangslager, or Dulags), and consequently no lists were passed on from these camps to the International Committee of the Red Cross (ICRC). Following the German invasion, huge numbers of Red Army soldiers were captured, especially in July, September, and October 1941. Crammed into camps of up to 100,000 men, poorly fed, often without housing or sanitary provisions, the prisoners soon suffered from debilitation. Certain groups of military personnel were denied POW status: On Adolf Hitler’s instruction, the OKW issued its “commissar order” on June 6, 1941, according to which political officers in the Red Army were shot in 1941 and 1942. Other groups killed by German troops included Soviet soldiers shot on the battlefield although they had surrendered, alleged Jews, in many camps so-called Asians, women in the Red Army, and in some camps Soviet officers. Orders for these killings originated from platoon to army command levels. More than 100,000 prisoners were handed over to the SS and police in 1941 and 1942; very few survived. In addition, an undetermined number of Soviet POWs, believed to be in the six-digit range, were shot by military guards because of their fatigue during marches or when unloading trains that had transported POWs. In certain German-occupied Soviet areas, Soviet military stragglers were killed instead of being taken prisoner, as were most Soviet partisan fighters. The Germans arbitrarily interned Soviet civilians in several POW camps in 1941. The German capture of large numbers of prisoners in similarly short time periods had not led to mass deaths in the German campaign against France in 1940. The majority of Soviet POWs died as a result of the deliberate undersupply of food, consequent starvation, frost, and hunger-related diseases. Prior to attacking the USSR, German authorities had planned the killing of tens of millions of Soviet citizens in “food-deficient” regions and in urban areas through starvation and a policy of brutal occupation. Racist and anticommunist, that scheme was to make good the overall German food deficit and to relieve the critical shortage of supplies for troops at the Eastern Front, perceived as crucial for the success of the giant military campaign. Thus, the plan was backed and co-initiated by the military. As military supplies always took priority, Soviet POWs became one of the specific groups targeted for extinction. In October 1941 food rations particularly for Soviet POWs considered “unfit for labor” were significantly reduced. On November 13 the German Quartermaster- General Eduard Wagner stated, “Soviet POWs unfit for labor in the camps have to die of starvation” (Notes of the Chief of Staff of the 18th Army, quoted in Streit, 1997, p. 157). In many camps those “fit for labor” were separated from those deemed unfit. Yet as guards often mistreated both groups equally and prisoners were worked to exhaustion with insufficient food, this intended distinction scarcely made any difference and initially fit prisoners perished, too. Death figures shot up to 2 percent daily, especially in the German-occupied Soviet and Polish territories. Nearly two out of three million Soviet POWs had died by the end of 1941. Measures to reduce the mortality rate, adopted from December on, only succeeded in the spring of 1942. However, hard labor, poor rations, and bad treatment continued to take their toll until 1945. Orders by the German leadership were countered with brutality, violence, or gross neglect on the ground. Military and economic considerations, racism against Slavs, Jews, and so-called Asians, and anticommunism were at the core of interrelated motives. In total, out of 5.7 million Soviet POWs, about three million died in German captivity, almost exclusively at the hands of the German military. Serious calculations, based on the interpretation of fragmentary German documents, range from “at least” 2.53 million to 3.3 million (Streit, 1997), with death figures revised downward for camps inside Germany on the basis of German records discovered in Russia and Germany in the late 1990s. Adding to their suffering, Soviet POWs returning to the USSR encountered collective suspicion and many were imprisoned without proper trial, as about a million had been forced or agreed under pressure to work for the German army, with hundreds of thousands fighting for the German army or SS under arms. Streim, A. (1981). Die Behandlung sowjetischer Kriegsgefangener im “Fall Barbarossa.” Heidelberg, Germany: C. F. Müller. Streit, C. (1978/1997). Keine Kameraden: Die Wehrmacht und die sowjetischen Kriegsgefangenen, 1941–1945, 4th edition. Bonn, Germany: Dietz. Streit, C. (2000). “Soviet Prisoners of War in the Hands of the Wehrmacht.” War of Extermination: The German Military in World War II, 1941-44, eds. Hannes Heer and Klaus Naumann. New York: Berghahn. The Russian émigrés would certainly not be welcomed back. Not only had they done nothing for their homeland, but the simple fact was that ‘Russia had been conquered with German blood for the protection of Europe against Russia’. When shortly after the German invasion of the USSR the Russian Grand Duke Vladimir, then living in exile at St Briac in France, forwarded to Hitler a proposed proclamation calling on all Russians to cooperate with the Wehrmacht in their liberation from Bolshevism, he was immediately and sharply rebuffed. The proclamation, Ribbentrop wrote to Abetz, would hinder rather than assist the German war effort in that it would provide the Bolsheviks with an opportunity to claim that ‘Russia was now threatened by the return of the old Tsarist feudalism’. There was of course never any question that the war Hitler unleashed in June 1941 was being fought for German ends and that the benefits accruing to other nations, though significant, not least the final exorcism of the red peril, were essentially incidental. During the 1930s Hitler had never portrayed Germany’s mission in Europe as anything other than a defensive bulwark against Bolshevism. Now, with his armies swarming towards Leningrad and Moscow, he was hardly likely to share his prize, particularly with states that had at best reacted with lukewarm support for the original Anti-Comintern Pact. When in mid-July 1941 a Vichy French newspaper suggested that the assault on the USSR was ‘Europe’s war’, and thus ought ‘to be conducted for Europe as a whole’, Hitler was appalled by this latest manifestation of Gallic impudence. In the course of the conference at which this issue was discussed, the Führer clearly outlined his intentions and the tactics he would employ to implement them. ‘In principle we have now to face the task of cutting the giant cake according to our needs,’ he explained, the order of priorities being ‘first, to dominate it; second, to administer it; and third, to exploit it’. In pursuit of these goals Germany would disguise its real aims in the Soviet Union through the simple expedients of avoiding superfluous declarations, emphasizing that the Reich had been forced to a military decision, and posing as a liberating force; it made no sense to ‘make people into enemies prematurely and unnecessarily’. The Germans would thus ‘act as though we wanted to exercise a mandate only’, but it must be clear ‘to us … that we shall never withdraw from these areas’. These predatory designs soon brought the Germans into conflict with those who genuinely hoped for liberation from Bolshevism. In the Ukraine, for example, the establishment in September 1941 of the civilian administration under Erich Koch, who, according to a postwar account based on the experiences of both Germans and Ukrainians, demonstrated no intention of enlisting the help of the Ukrainians in the fight against Bolshevism, effectively destroyed the friendly relationship that had been established between the Wehrmacht and the indigenous population. As an early victory was expected, it was felt that Ukrainian participation in the struggle would serve only to complicate German aims in the Ukraine, especially in so far as these concerned its economic exploitation, for which the ‘most stringent measures’ were envisaged. Already by October 1941 the information that was reaching London about the nature of the German occupation led the Foreign Office to comment on the ‘grave psychological mistakes’ the Germans had made in handling the conquered population, for ‘their methods can only serve to rally the Russian people round the [Soviet] regime’. The thoroughly inappropriate nature of German policy and propaganda in the occupied territories was similarly highlighted by two collaborating Soviet officers who complained that it was simply not enough to stress the deprivations Bolshevism had inflicted on the Russian people. By late 1942 this repetitive and uninspiring message was becoming increasingly ineffective, not least as Soviet prisoners of war and the inhabitants of the occupied territories generally held that rule by Germany, far from being a liberation, was altogether a ‘bad bargain’. In contrast to the sterile monotony of German propaganda, Stalin, who had reintroduced religious freedom and curtailed the activities of the political commissars, had ‘taken the trumps out of Germany’s hands’. Goebbels’s’ colleague, Eberhardt Taubert, placed the responsibility for the hopeless conditions in the east squarely on the shoulders of Alfred Rosenberg, who had been appointed minister for the occupied territories shortly after the launching of Barbarossa. Taubert pointed out that Rosenberg had not only blamed the Jews for Bolshevism, but also the Russian people for tolerating it. Due to impurities of blood, the Russian had, in Rosenberg’s view, a ‘natural affinity to the destructive ideologies of Bolshevism’. It might be, Taubert continued, that Rosenberg had not fully thought out the consequences of his actions, but that did not excuse his whole notion of the Russians as Untermenschen being the product of a false conception. Moreover, Rosenberg had possessed insufficient strength of character to rectify his mistake once the detrimental effects had become apparent. Although Taubert’s diatribe against Rosenberg is understandable, if only for the obstacles the incompetent Reichsleiter placed before the German propagandists in the east, it might yet be a little harsh on a man who in March 1942 was warning against any reference to the occupied territories as German ‘colonial territory’, as this greatly annoyed the local populations and played directly into the hands of the Soviet propagandists. During the Song Dynasty there was also great amount of attention given to the building of efficient automotive vessels known as paddle wheel craft. The latter had been known in China perhaps since the 5th century, and certainly by the Tang Dynasty in 784 with the successful paddle wheel warship design of Li Gao. 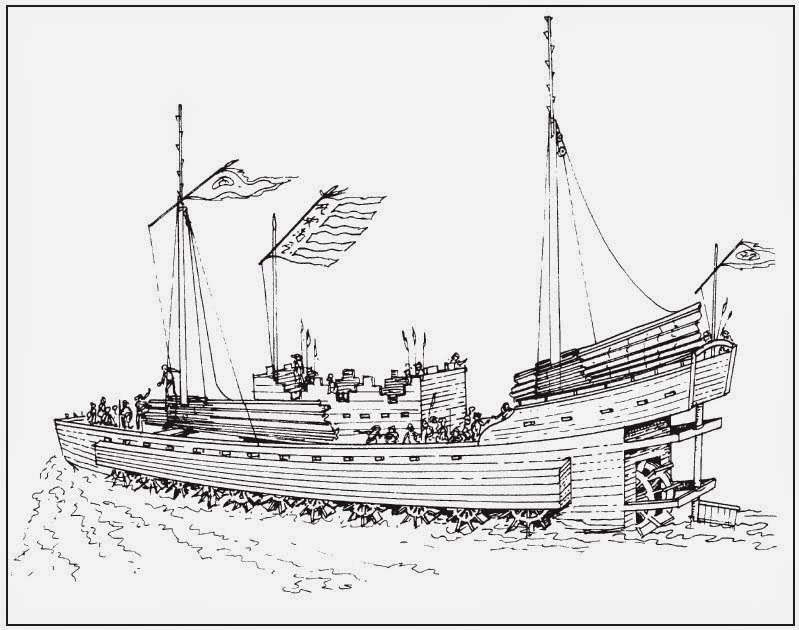 In 1134 the Deputy Transport Commissioner of Zhejiang, Wu Ge, had paddle wheel warships constructed with a total of nine wheels and others with thirteen wheels. 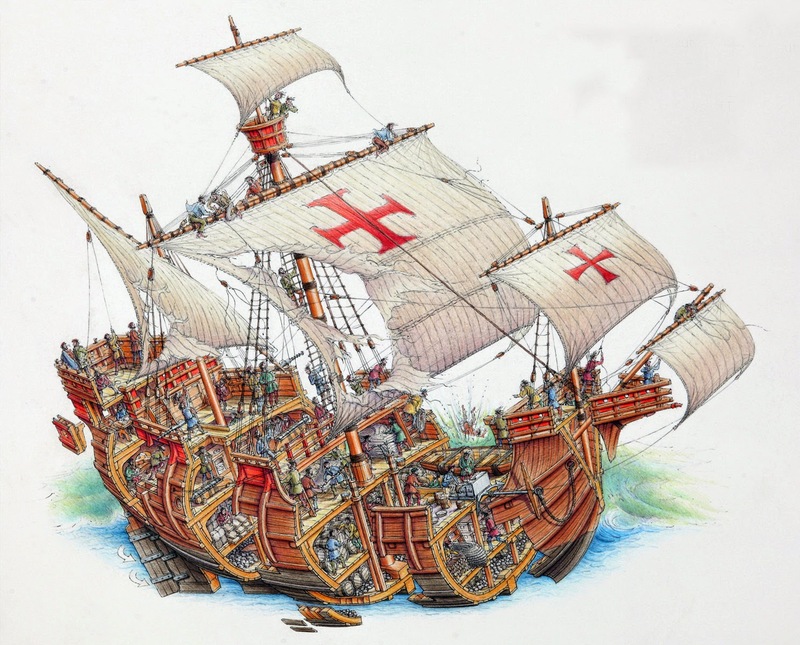 However, there were paddle wheel ships in the Song that were so large that 12 wheels were featured on each side of the vessel. In 1135 the famous general Yue Fei (1103–1142) ambushed a force of rebels under Yang Yao, entangling their paddle wheel craft by filling a lake with floating weeds and rotting logs, thus allowing them to board their ships and gain a strategic victory. In 1161, gunpowder bombs and paddle wheel crafts were used effectively by the Song Chinese in the Battle of Tangdao and the Battle of Caishi against the Jurchen Jin Dynasty, who made an unsuccessful invasion of the Southern Song along the Yangtze River. 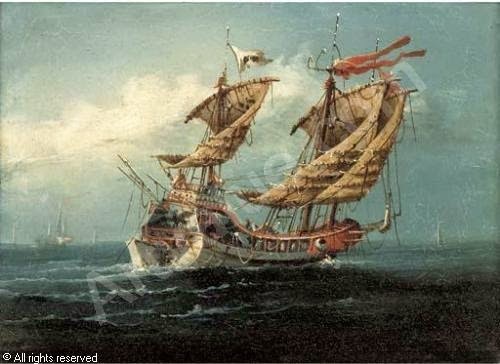 In 1183 the Nanjing naval commander Chen Tang was given a reward for constructing ninety paddle wheel craft and other warships. In 1176, Emperor Xiaozong of Song (r. 1162–1189) issued an imperial order to the Nanjing official Guo Gang (who desired to convert damaged paddle wheel craft into junk ships and galleys) not to limit the number of paddle wheel craft in the navy’s dockyards, since he had high esteem for the fast assault craft that won the Chinese victory at Caishi. However, paddle wheel craft found other uses besides effective assaults in warfare. The Arab or Persian Commissioner of Merchant Shipping for Quanzhou, the Muslim Pu Shougeng (who served from 1250–1275) noted that paddle wheel ships were also used by the Chinese as tugboats for towing. 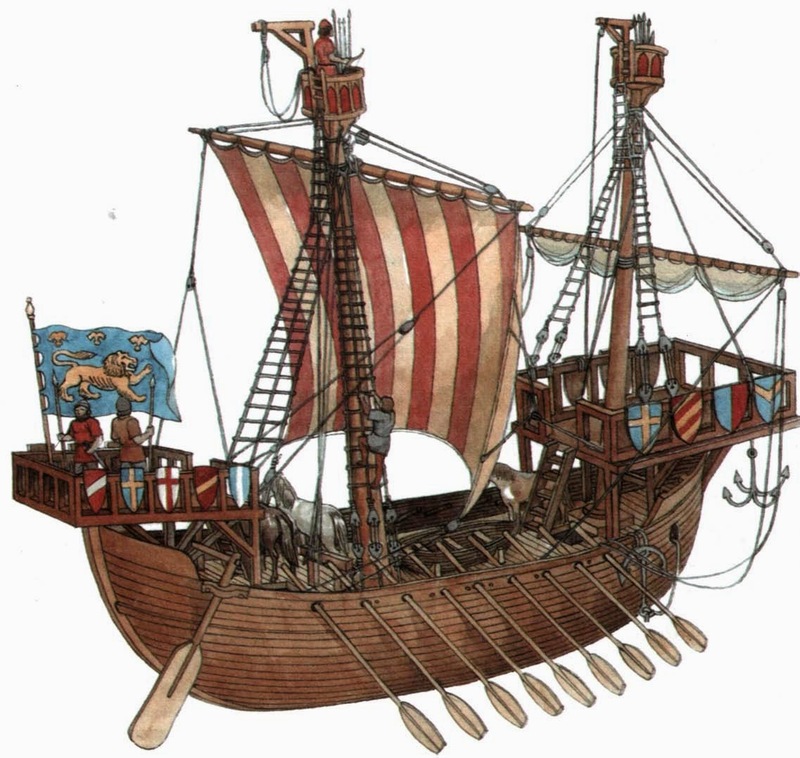 A multi-deck Carrack had three masts with the different sails: to the foresail: and mainmasts (by the first and by the second) – straight lines, and on the last third mizzensail to mast there was the slanting Latin sail, which facilitated maneuvering. 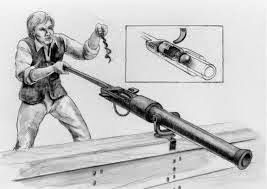 The patrolmen or pointers were located on the mastheads with the reserve armament.